RESOLVED, That the General Assembly of Virginia, doth unequivocably express a firm resolution to maintain and defend the Constitution of the United States, and the Constitution of this State, against every aggression either foreign or domestic, and that they will support the government of the United States in all measures warranted by the former. 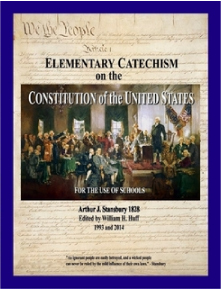 That this assembly most solemnly declares a warm attachment to the Union of the States, to maintain which it pledges all its powers; and that for this end, it is their duty to watch over and oppose every infraction of those principles which constitute the only basis of that Union, because a faithful observance of them, can alone secure it's existence and the public happiness. That this Assembly doth explicitly and peremptorily declare, that it views the powers of the federal government, as resulting from the compact, to which the states are parties; as limited by the plain sense and intention of the instrument constituting the compact; as no further valid that they are authorized by the grants enumerated in that compact; and that in case of a deliberate, palpable, and dangerous exercise of other powers, not granted by the said compact, the states who are parties thereto, have the right, and are in duty bound, to interpose for arresting the progress of the evil, and for maintaining within their respective limits, the authorities, rights and liberties appertaining to them. That the General Assembly doth also express its deep regret, that a spirit has in sundry instances, been manifested by the federal government, to enlarge its powers by forced constructions of the constitutional charter which defines them; and that implications have appeared of a design to expound certain general phrases (which having been copied from the very limited grant of power, in the former articles of confederation were the less liable to be misconstrued) so as to destroy the meaning and effect, of the particular enumeration which necessarily explains and limits the general phrases; and so as to consolidate the states by degrees, into one sovereignty, the obvious tendency and inevitable consequence of which would be, to transform the present republican system of the United States, into an absolute, or at best a mixed monarchy. That the General Assembly doth particularly protest against the palpable and alarming infractions of the Constitution, in the two late cases of the "Alien and Sedition Acts" passed at the last session of Congress; the first of which exercises a power no where delegated to the federal government, and which by uniting legislative and judicial powers to those of executive, subverts the general principles of free government; as well as the particular organization, and positive provisions of the federal constitution; and the other of which acts, exercises in like manner, a power not delegated by the constitution, but on the contrary, expressly and positively forbidden by one of the amendments thereto; a power, which more than any other, ought to produce universal alarm, because it is levelled against that right of freely examining public characters and measures, and of free communication among the people thereon, which has ever been justly deemed, the only effectual guardian of every other right. That this state having by its Convention, which ratified the federal Constitution, expressly declared, that among other essential rights, "the Liberty of Conscience and of the Press cannot be cancelled, abridged, restrained, or modified by any authority of the United States," and from its extreme anxiety to guard these rights from every possible attack of sophistry or ambition, having with other states, recommended an amendment for that purpose, which amendment was, in due time, annexed to the Constitution; it would mark a reproachable inconsistency, and criminal degeneracy, if an indifference were now shewn, to the most palpable violation of one of the Rights, thus declared and secured; and to the establishment of a precedent which may be fatal to the other. That the good people of this commonwealth, having ever felt, and continuing to feel, the most sincere affection for their brethren of the other states; the truest anxiety for establishing and perpetuating the union of all; and the most scrupulous fidelity to that constitution, which is the pledge of mutual friendship, and the instrument of mutual happiness; the General Assembly doth solemnly appeal to the like dispositions of the other states, in confidence that they will concur with this commonwealth in declaring, as it does hereby declare, that the acts aforesaid, are unconstitutional; and that the necessary and proper measures will be taken by each, for co-operating with this state, in maintaining the Authorities, Rights, and Liberties, referred to the States respectively, or to the people. That the Governor be desired, to transmit a copy of the foregoing Resolutions to the executive authority of each of the other states, with a request that the same may be communicated to the Legislature thereof; and that a copy be furnished to each of the Senators and Representatives representing this state in the Congress of the United States. Agreed to by the Senate, December 24, 1798. Resolved, That the General Assembly of Virginia will cooperate with the authorities of the United States in maintaining the independence, Union and Constitution thereof, against the hostilities or intrigues of all foreign Powers whatsoever; and that although differences of opinion do exist in relation to internal and domestic measures, yet a charge that there is a party in this Commonwealth under the influence of any foreign Power is unfounded and calumnious. Resolved, That the General Assembly do, and will always, behold with indignation, depredations on our commerce, insults on our citizens, impressments of our seamen, or any other injuries committed on the peoples or Government of the United States by foreign nations. Resolved, Nevertheless, that our security from invasion and the force of our militia render a standing army unnecessary; that the policy of the United States forbids a war of aggression; that our whole reliance ought to be on ourselves; and therefore, that while we will repel invasion at every hazard, we shall deplore and deprecate the evils of war for any other cause. Resolved, That a copy of the foregoing resolution be sent to each of the Senators and Representatives of this State in Congress.